AMBC hosts regular group rides during the warmer months (March – October) / Daylight Saving Time. Check this page, the AMBC Blog, AMBC’s Facebook page or follow AMBC on Twitter for updates on these and other group rides. 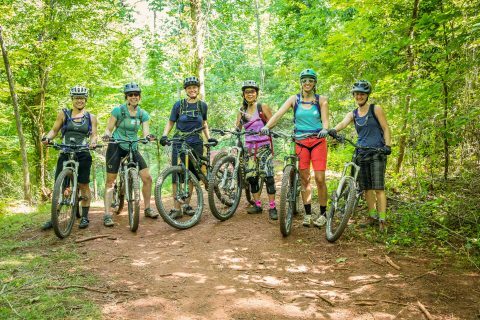 This is AMBC’s Big Group ride—we tour the trails of Knoxville’s Urban Wilderness (including Ross Marble, Marie Myers Park, Hastie Natural Area, Forks of the River and more), every Tuesday evening, weather permitting. Riders usually meet at Meads Quarry or Baker Creek Preserve ready to ride at 6pm. The ride usually has 30 or more riders, which always break off into sub-groups, depending on skill level, familiarity with the trails or desire to ride hard or take it easy! Come back to the parking lot for dinner from one of Knoxville’s many excellent food trucks. Follow AMBC on Facebook and Twitter, or join the Knoxville Cycling group on Facebook for updates on ride locations and food trucks. Ride Dirt Trails — Not Mud Trails! Help keep these trails great for you and others by not riding when they’re muddy. Riding on a mud trail wrecks the trail. It leaves ruts, contributes to erosion, and creates an unrideable, hard to fix trail surface. This wastes valuable resources repairing the trail, and ruins the experience of riders on the next dry day. If you are leaving a visible rut, the trail is too muddy to ride. Warm weather during Spring and Fall is especially critical for trails, as the freeze-thaw cycle results in a soft surface. If trails are muddy, please ride on pavement or gravel until the trails dry out or refreeze.